The JUVEDERM family of dermal fillers are made of a smooth gel form of injectible hyaluronic acid. Hyaluronic acid is normally found in the skin and other tissues of the body. Injectible hyaluronic acid works by drawing water into the area and holding it at the injection site. It also acts as a cushioning agent. The newly injected area has temporary volume. The skin now appears smoother and more youthful. Dermal fillers can help you look younger and more refreshed without the need for surgery. JUVEDERM fillers can last for nine months and up to one year for the correction of moderate to severe lines and wrinkles, lifting cheeks and enhancing lips. 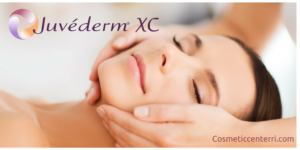 The results are immediate and typical correction for JUVEDERM XC, Ultra and VOLBELLA will last approximately six months. VOLUMA and VOLLURE can last up to eighteen months. The injection process only takes about fifteen minutes. Most patients do not require an anesthetic, although some fillers contain a local anesthetic for a more comfortable injection.